TDmonthly® - New Toys and Games: AnimaLamp from MOBI Technologies, Inc.
Who says children and wild life can’t play together? Mobi introduces AnimaLamps™, the cool-running LED light that’s great for desktop, late night changing table and feeding, reading in bed, games, and playtime. Portable and solidly built, AnimaLamps ™ can go anywhere. 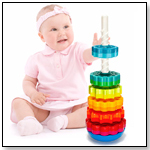 Adjustable brightness, one-touch operation and built-in rechargeable battery makes it the perfect light for children. Caution: we’ve heard reports of parents stealing AnimaLamps ™ from the nursery. Awards: Mom's Choice Gold, NAPPA Gold and National Parenting Center Seal of Approval awards. AnimaLamps™ are portable, cool-running LED lights that can be used as a desk lamp, for reading in bed, during playtime, or even for late night diaper changes and feeding sessions. The lamps have a rechargeable battery, and the brightness can be adjusted. Our reviewer was very impressed with the AnimaLamp. The rechargeable battery made it perfect for using around the house - from the playroom to the nursery. It was also useful in the car - kids can read a book or do an activity in the back seat even at night. The adjustable brightness got big accolades from our reviewer. With a simple touch the brightness can be adjusted to suit a variety of activities. The AnimaLamp can be used on the brightest level to read before bed, then dimmed and used as a night light. Another great feature of the AnimaLamp it that it uses LED lights, which don´t get hot. Little hands won´t get burned if they accidentally touch the light. Parents also don´t have to worry about cord safety, as the lamp uses a rechargeable battery and doesn´t need to be plugged into the wall to work. Not only is the AnimaLamp adorable - customers can choose from monkey and giraffe designs - it is also ideal for families with small children. It´s portability means it can be used in a variety of situations, and parents of even the youngest children don´t need to worry about safety, as the lamp is cordless and uses cool-to-the-touch LED lights. The battery charge lasts 8-12 hours, making it the ideal night light or car light for road trips. 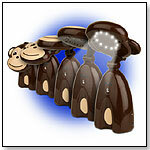 Customers will also love how versatile the adjustable brightness control makes the AnimaLamp. And, you can tell them that the AnimalLamp is the winner of Mom´s Choice Gold, NAPPA Gold and National Parenting Center Seal of Approval awards.